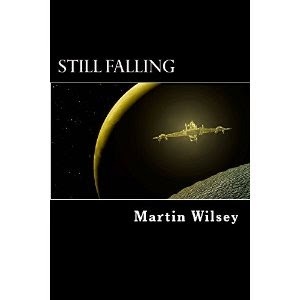 "Still Falling" (book 1 in the Solstice series), by Martin Wilsey, is a sci-fi novel that follows the exploits of a maintenance engineer in deep space. Stationed on Ventura, a giant deep space survey ship with a crew of 2,000, the protagonist, Barcus, is among those ambushed in an attack during a scheduled planet survey. Barcus survives the attack, but the others do not. He flees to the planet's surface, where he finds out the murders, and the murders-to-come, are part of a grand conspiracy. I enjoyed following Barcus as he struggled to find a way to stop the senseless murders. The sci-fi aspects of the story, from the descriptions of the technology to the planets, were done well and added to the story. The plot is paced perfectly with lots of suspense and mystery. I would recommend this book to anyone who wants a fast-paced sci-fi novel with lots of action and suspense.